Your family could be here. 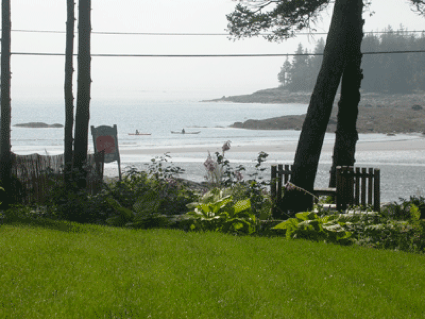 Summer is at its peak at Drift Inn Beach in Port Clyde, Maine. You gaze lazily out from your chair on the lawn at Drift Inn Cottage and see kayakers testing the ocean water beyond the sandy beach. "Hmmmm, should I be active today, or rest in the hammock?" Maine lets you relax and dream. Come and experience it for a week or more. Make Drift Inn Cottage and Beach a part of your family memories. Rent the cottage now for 2012 (the rustic bunkhouse is included). 6-8 persons can be accommodated. Click the links at the top of this page to tour the cottage, gardens and beach. Drift Inn cottage was featured in the New York Times "Escapes" section in 2009. Port Clyde was featured in a recent article in Down East magazine. VIEW A VIDEO SLIDE SHOW OF THE COTTAGE IN PORT CLYDE.